The Tax-Free Savings Account annual contribution limit has been increased to $6,000! Here is the 2019 TFSA Explained, so you can make the most of your money in the New Year. In 2009, the Government of Canada introduced the Tax-Free Savings Account (TFSA) to help Canadians save money. The TFSA allows you to earn tax-free investment income on money you put into the account. The Tax-Free Savings Account is hands-down the best savings and investment vehicle available to Canadians, but few understand how it works. Many use it incorrectly, and even more people don’t use the TFSA at all! Here is everything you needed to know about the new 2019 TFSA explained, so you can get the most bang for your buck. You can set up a Tax-Free Savings Account at most financial institutions. However, the type of TFSA account and the fees can vary drastically. You want to look for the highest return possible with the lowest fees! Wealthsimple – a roboadvisor that lets you get your TFSA money working for you in the stock market, completely hassle-free. Tangerine – an online bank that provides high-interest savings and mutual funds to help you grow your TFSA faster. Questrade – an online discount brokerage that will let you buy and sell stocks, bonds, and ETFs in your TFSA at the lowest cost. Oaken Financial – an online bank that offers high-interest GICs to supercharge your TFSA savings. Meridian Credit Union – a credit union providing high-interest TFSA savings accounts with no fees. The Tax-Free Savings Account (TFSA) was introduced in 2009 and provides Canadians with a tax-sheltered account to grow their money. As the name implies, you will pay no taxes on the profits earned inside of the TFSA. The designation as “Savings Account” is inaccurate, because your TFSA doesn’t actually have to be a savings account. “Investment Account” would be a better description, as you can hold investments like stocks, bonds, mutual funds, and ETFs in your Tax-Free Savings Account. When you invest in a TFSA, all of the interest, dividends, and capital gains you earn are tax-free. Investing is actually the best way to utilize the power of the Tax-Free Savings Account since you typically earn higher returns investing in the stock market compared to saving in a bank account. The higher your investment income in a TFSA, the greater the benefit you’re getting from its tax-free power. Are you 18 years of age or older? Do you have a valid SIN number? Are you a resident of Canada? If you answered yes to all three questions, CONGRATULATIONS! You can open a TFSA! Well, except where the age to enter into legal contracts is 19 years of age. In those provinces and territories you will have to wait until you are 19 years old to open a TFSA. Fortunately, the contribution limit room for the year you turn 18 is added to your total contribution limit. Do you spend a lot of time outside of Canada? You MAY be considered a “non-resident” for tax purposes. Check the CRA guidelines on what constitutes a non-resident for tax purposes with your TFSA. Opening a TFSA is as easy as opening a Standard bank account! You basically just need to go to your preferred financial institution with government-issued identification and your Social Insurance Number and you can set one up. Or more! Remember, there’s no limit to how many TFSAs you set up, just a contribution limit! Don’t feel like leaving the house? The internet is great for avoiding human contact in these situations! Yes, you can even register for a TFSA online! Just make sure you still have your government I.D. and Social Insurance Number handy. You’ll need to give the exact information requested as printed on your documents to open your account. You can have as many TFSAs as you want, but you have to stay within your annual and lifetime Tax-Free Savings Account contribution limits. When it comes to opening and funding your TFSA, there are two numbers you need to be aware of: the annual contribution limit and the lifetime contribution limit. The TFSA annual contribution limit is fixed each year. When the Tax-Free Savings Account was first introduced in 2009, the annual contribution limit was $5,000. It went as high as $10,000 one year, then dropped back down to $5,500.You can see the yearly breakdown for the TFSA contribution limits set by the Canada Revenue Agency here. In 2019, the Tax-Free Savings Account contribution limit is $6,000. However, you might be able to put away even more depending on your age and how much you’ve put away in a TFSA so far! The TFSA lifetime contribution limit is the cumulative total of annual contribution limits from the year you turned 18. If you were 18 years old in 2009, then you are entitled to the full lifetime contribution room of the TFSA. If you didn’t turn 18 until after 2009, you’re only entitled to the cumulative total of annual contribution room beginning in the year you turned 18. If you have never had a Tax-Free Savings Account, or if you have not been contributing the maximum to your TFSA each year, you can catch up on the unused contribution room now. This means you may be able to contribute more to your TFSA than the 2019 limit of $6,000. 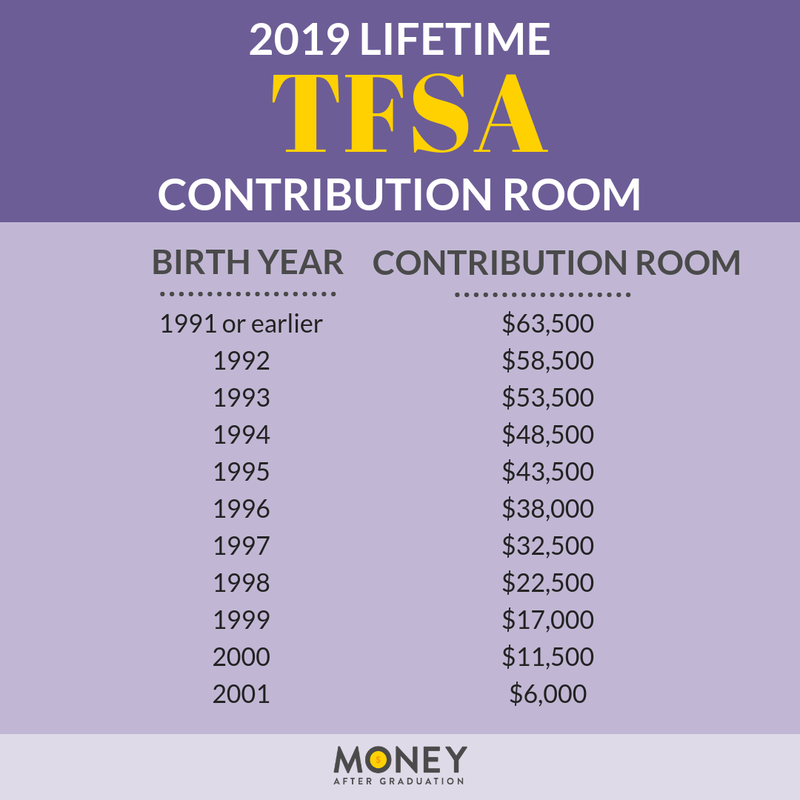 The new 2019 TFSA contribution limit of $6,000 brings the TFSA lifetime contribution limit to $63,500. If you were over the age of 18 in 2009, you’re entitled to the full $63,500 of contribution room, minus any contributions you’ve already made. Most people typically go to their bank for financial information. Society has been conditioned to do so. With the advent of the internet, it is much easier to compare company products. As long as the institution you will be working with is a member of, or keeps your money with members of the Canadian Investors Protection Fund (CIPF) you should not have too much to worry about. Being a member of the CIPF essentially means that you can get your money back in the event of the company going bankrupt, up to $1 Million. When choosing where to open your TFSA, one of the main focuses should be the cost. High fees can eat into your investment returns, and reduce the amount of money you’re earning tax-free, completely defeating the purpose of using a Tax-Free Savings Account! Fees can be flat rate charges or a percentage of your balance or investment returns. Try to look for a TFSA that provides no account, minimum balance, or inactivity fees. If you have a TFSA investment account, try to keep management fees under 1% and trading commissions should be less than $10 per trade. Wealthsimple allows you to invest in the stock market in your TFSA. Wealthsimple is a robo-advisor. This doesn’t mean your money is managed by a robot, but it does mean that it’s managed automatically. There is a real live person making the investment decisions behind the scenes, but they’ll be investing your cash based on your investor profile and financial goals. All you need to do is put money into the account. This is perfect for new investors who want to get into the stock market but aren’t sure where to start. It’s also great for knowledgeable investors who don’t want the hassle of managing their portfolios. Get your first $10,000 with Wealthsimple managed for free by clicking here! Tangerine provides TFSA savings accounts and TFSA mutual funds, so you can save cash or invest under that Tax-Free Savings Account umbrella. Tangerine has a few good TFSA options as well. In the investment side of things they keep things nice and simple. Their rate is lower than the traditional financial advisor at 1.07%, and the majority of their product offerings include indexed investment options. In general, indexed investments tend to offer a diversified portfolio that typically beats most companies offering “actively investing” strategies. Questrade is an online broker designed for people who want to keep the fees down. Their fee structure is really quite impressive! They have a self-directed investor route that charges $4.95 to $9.95 per stock trade (1 cent per stock, with a minimum charge of $4.95). You can actually purchase ETF’s, for FREE! Selling them is the same price as selling stock. QuestWealth Portfolios is the name of their other avenue, where they manage your money based on your investor profile. 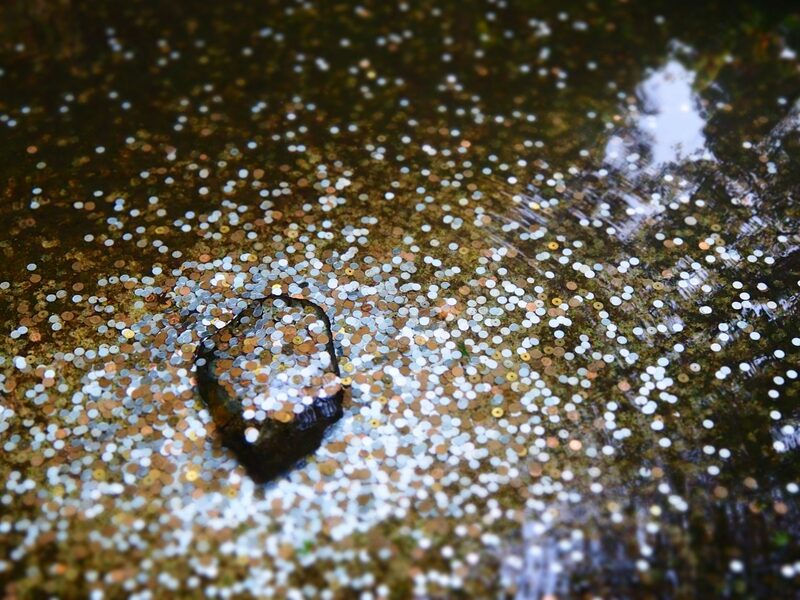 Instead of 1-4% fees like traditional investment firms, they charge 0.25% management fee! Build up $100k in your account and this drops to 0.20%! If you open one of their TFSA high interest savings accounts, you can earn 1.25% interest- about the highest in the industry for a savings account. Tangerine’s TFSA GIC’s are also on the high-end at 3.5%. Best part of these accounts: no minimum balances and no silly service or maintenance fees! Winning! You can withdraw money from your Tax-Free Savings Account without penalty at any time. Unlike the RRSP, you don’t have to be retired or a certain age to withdraw from your TFSA. You can also spend your money however you please without consequence. The Government of Canada won’t know (or care) if you use your TFSA to go on a trip or to save for something else. However, it’s important to remember that the TFSA is best utilized as a retirement savings vehicle and that should be your goal with this account. You don’t need to earn tax-free investment returns on your vacation savings, but you do need tax-free investment returns on your retirement savings. Choose wisely. When you make a withdrawal from a Tax-Free Savings Account, the amount you withdraw is added to your contribution limit the following year. You never lose TFSA contribution room, which is another powerful characteristic of this account. If you end up putting more into your TFSA than the contribution limit allows, you can expect to be taxed. The tax comes at a rate of 1% per month on the highest excess of your contribution, until withdrawn or until your contribution limit increases enough to make up the room. $2000 x 1% x 2 months = $40 of tax. Interesting point: you are taxed on the highest amount of excess until the entire balance is within your contribution limit. $4500 x 1% x 4 months = $180. Even though you were $4500 over your limit for one month, you would be taxed as if you were over it for 4 months. The highest amount is taxed until the full amount is brought back under the contribution limit. Clear as mud? The CRA has more examples here. Are TFSAs Just For Investing? TFSAs are especially great for investing but can also be used for other purposes. Building up your emergency fund? If you are just starting to save, consider using a TFSA. My wife and I used a TFSA that I had built up before we were married as an emergency fund. In a span of 12 months, we had a wedding, purchased our first home, and had our first baby! Not minor expenses! The peace of mind that came with knowing that this money was available if we were really desperate was a lifesaver! We had some very tight months financially when our first little guy came along. Knowing that the TFSA had money that we could fall back on saved a huge amount of relationship stress. Tax-Free Savings Accounts are great! The new 2019 TFSA got even better with a contribution limit increase to $6,000. Since you can have more than one Tax-Free Savings Account, they can be used for several purposes. The TFSA is a great place to stash your emergency fund, save up for a downpayment, and build your retirement nest egg. Just be sure to stay within your contribution limit, and choose a cost-effective investment account for your TFSA. Watch the balance grow and enjoy your journey to financial freedom!